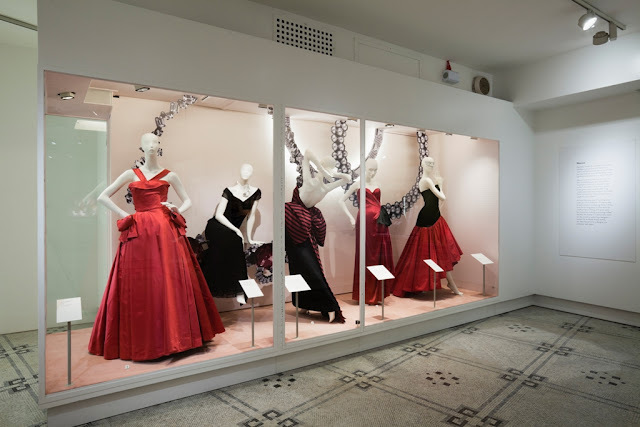 London’s Victoria & Albert Museum (V&A) is marking the unveiling of its refurbished fashion galleries on 19 May with the exhibition ‘Ballgowns: British Glamour Since 1950’. If the title might conjure anachronic perceptions of fashion, the stunning display dissipates any concern. 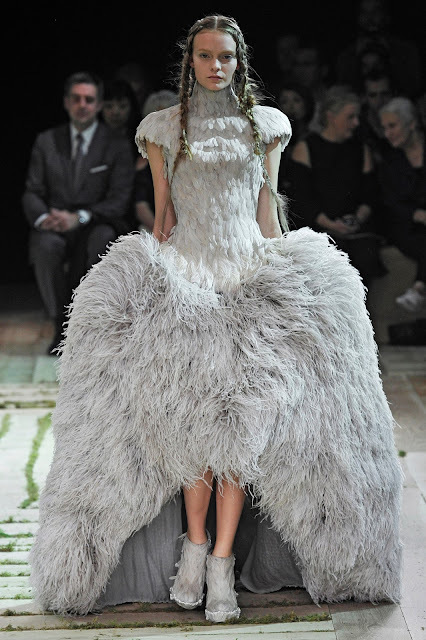 Instead of focussing on old-fashioned tropes and mores of fashion, this is a highly seductive and accomplished presentation of couture as the highest form of sartorial craft and creative excellence. 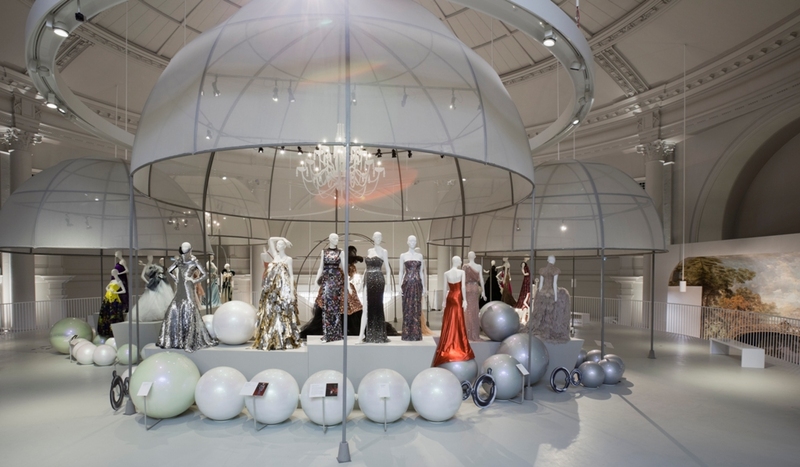 The exhibition, laid out over two floors, features more than 60 ballgowns designed and worn by women between 1950 to the present day. 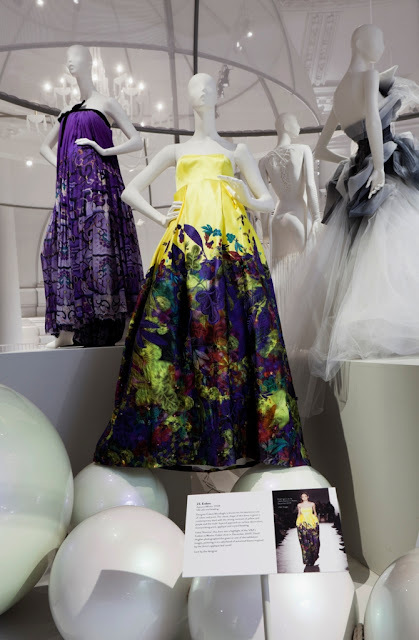 The displays on the ground floor of the galleries illustrate an historical narrative about how ballgowns moved from the private domain of dinner parties and debutante balls to the public realm of charity galas and red-carpet events. 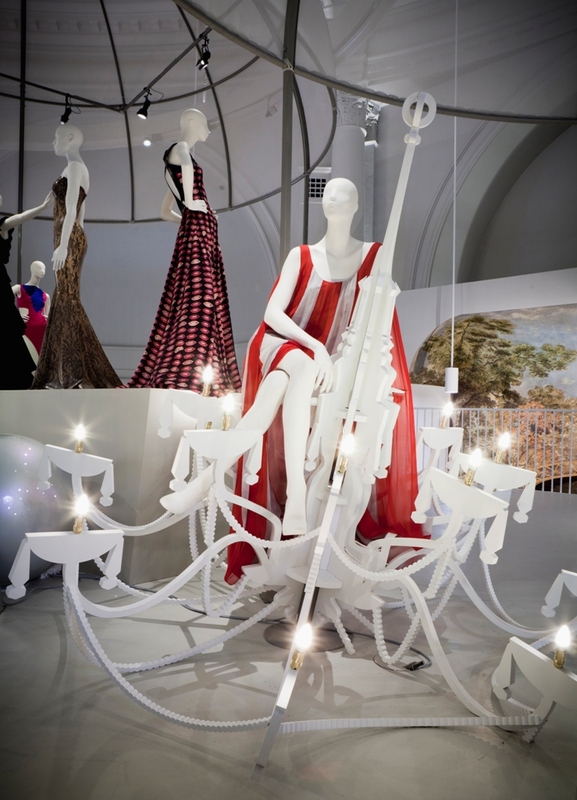 In addition, this section of the exhibition analyses how the public perception of couture dresses has evolved from being associated with royalty and exclusivity to being more democratically worn by celebrities on the red carpet. Also exhibited on this level are six short films and small displays of accessories, namely gloves, bags and shoes. Upstairs, the dramatic mezzanine level, with its domed pavilions that mirror the grand ceiling and alcoves of the newly lit and restored Octagon Court, was conceived as a glamorous ballroom where mannequins sit atop large pearls in order to display dresses designed over the last five years. 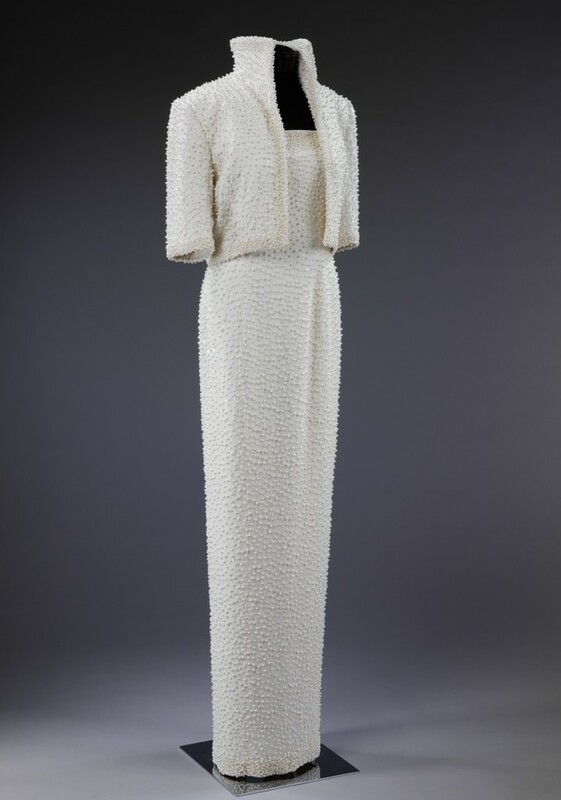 On display are ballgowns worn by members of the royal family, such as a Norman Hartnell’s dress in tulle, silk satin and beading for Elizabeth the Queen Mother, and Catherine Walker’s 1989 ‘Elvis Dress’ in silk crepe, pearls and beading for Princess Diana. 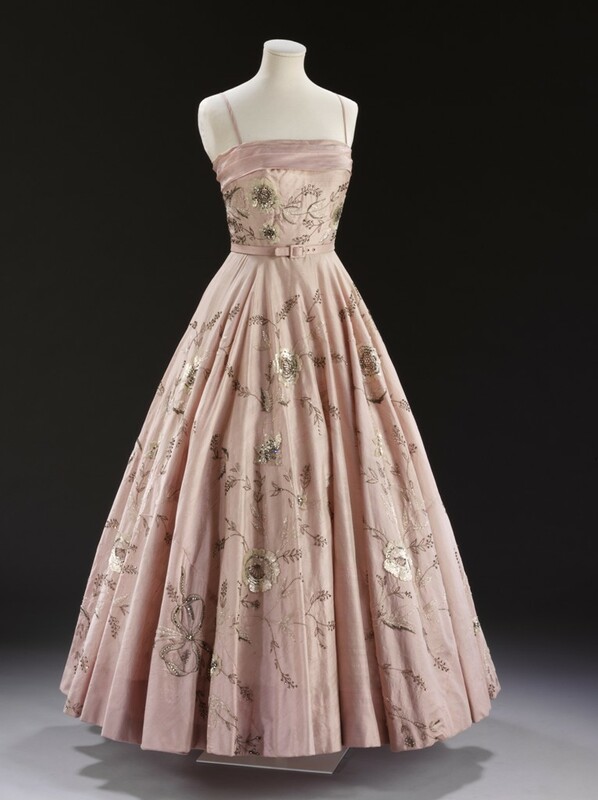 A large number of the dresses exhibited have been designed for, and worn by actors and singers at red-carpet events over the decades. Such celebrities include Beyoncé, Sandra Bullock, Joan Collins, Daphne Guinness, Elizabeth Hurley, Bianca Jagger and Helen Mirren. 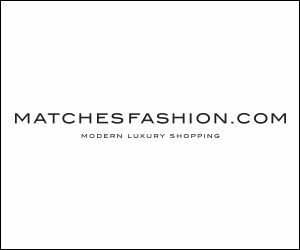 Fashion designers and labels featured include Hardy Amies, Murray Arbeid, Belleville Sassoon, Hussein Chalayan, Ossie Clark, Erdem, Mark Fast, Bill Gibb, Giles, Roksanda Illincic, Mary Katrantzou, Atsuko Kudo, Marchesa, Julien MacDonald, Alexander McQueen, Bruce Oldfield, Jenny Packham, Gareth Pugh, Zandra Rhodes, Jonathan Saunders and Victor Stiebel. 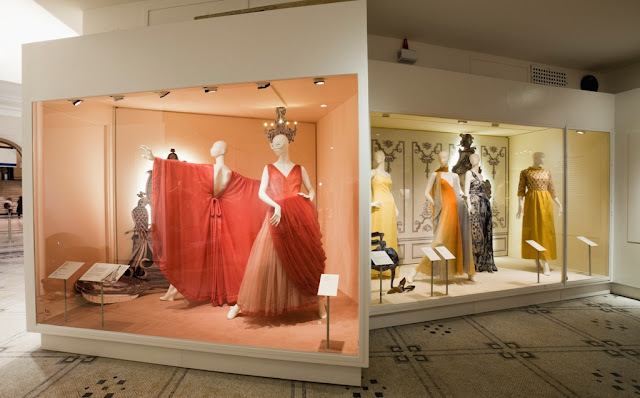 The exhibition lies at the centre of a display of 450 pieces from the museum’s main fashion collection, a rich archive of over 100,000 pieces that range from thimbles to ballgowns. Designed by 6a architects, the redeveloped space will allow the public to observe and enjoy the extraordinary wealth of items that illustrate styles and fashion habits over the ages. 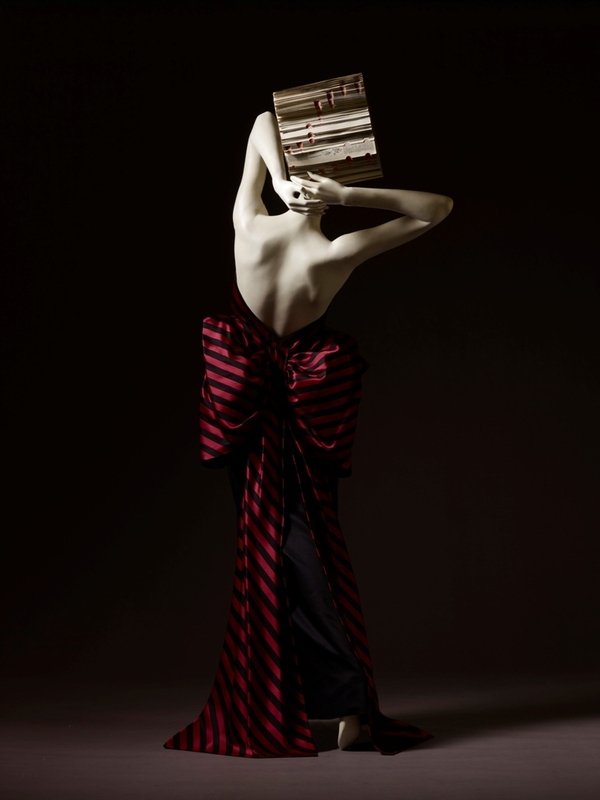 The exhibition is open to the public until 6 January 2013. For more information, visit www.vam.ac.uk/ballgowns. Wonderful! I think that V&A is one of the most interesting museum of London. I went there once "by mistake", looking for some rare Pre-Raphaelites paintings....I discovered an entire world of beauty. I would like to be there to see the exhibition. Thanks for share.